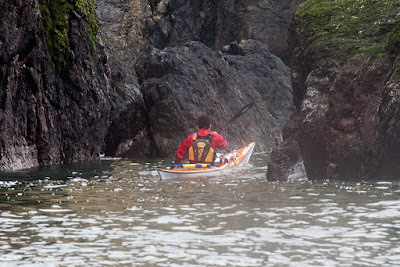 P&H Cetus MV sea kayak, long term test and comparative review. Like its siblings, the Cetus HV and LV, this is a low, sleek kayak which hides its size. The Cetus MV is of Swede form (wide point behind the cockpit) with marked taper and rocker towards the ends. As a result from the cockpit the sculpted foredeck seems narrower than other kayaks. This is a design which promotes speed through the water (despite allowing a broad beam for stability). The Cetus stern forms a drawn out inbuilt skeg similar to those on the Alaw Bach and Xcite. This gives a long waterline length for speed when the kayak is upright but disengages from the water for manoeuvrability when the kayak is edged (if carrying an appropriate load). Moving forward, the bottom is wide and shallow under the cockpit with a slight V at the keel. This runs into a rounder section towards the bow, with no hard chines between the sides and the bottom. 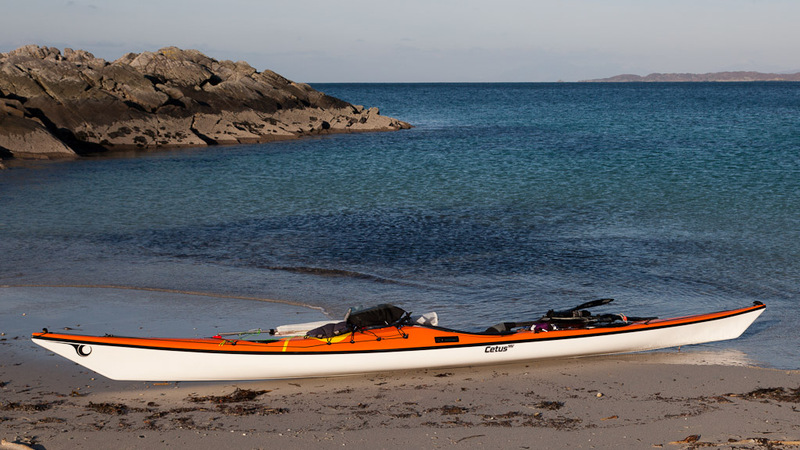 In comparison with a similar volume "traditional British style" sea kayak (such as the Nordkapp LV), the Cetus MV's cross section at its widest point is further aft and is wider and shallower. It is longer with more rocker than the Malin Gometra but has a similar waterline length. I have used eight separate 2009/2011 P&H Cetus HV/MV/LV kayaks and my friends have bought four. All have shown a superb quality of finish in respect of lamination and assembly of the hull, deck and bulkheads. The test Cetus MV arrived blemish free but about 4 weeks after it was delivered in November 2011 it developed some slight rippling of the hull sides on either side of the skeg box. This was noticeable only in some angles of light but P&H offered to take it back. However, as I was enjoying it so much (and as it had no impact on performance) I hung on to it. The GRP bulkheads are fitted with a rubber bung with a relief valve to prevent implosion/explosion of hatch covers in extreme temperature conditions. There were no faults in the fitting of components and accessories. 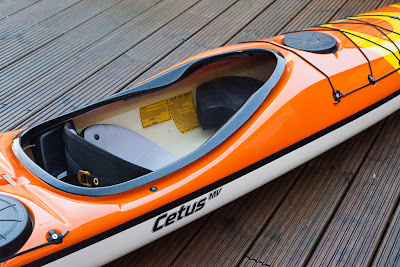 The test Cetus MV kayak had a plain but very smart orange deck and white hull but three of those who have paddled it, have gone on to buy a Cetus in stunning glitter finishes in turquoise or dark blue. The long keyhole cockpit makes this one of the easiest kayaks to get in and out of, especially if you suffer from hip or knee problems like me. The plastic seat has a removable padded cover and is fitted low in the cockpit and this allowed me (at 85kg) to fit snugly. 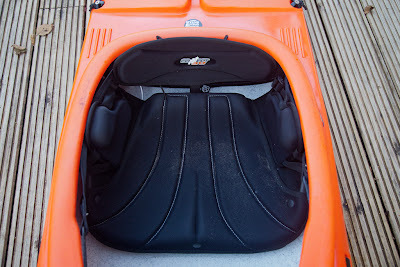 For those that like to paddle using full hip rotation and do not like seat covers, the seat base is comfortable on its own and supportive, with just the right amount of rise at the front. The seat back was also supportive, not too high for layback rolls and reasonably resistant to folding forward under your bum during rescues/recoveries. Its tension adjusts effectively using a belt and two corrosion resistant D buckles.Smaller paddlers should stick some foam hip pads to the sides of the seat to ensure good contact for edge control. 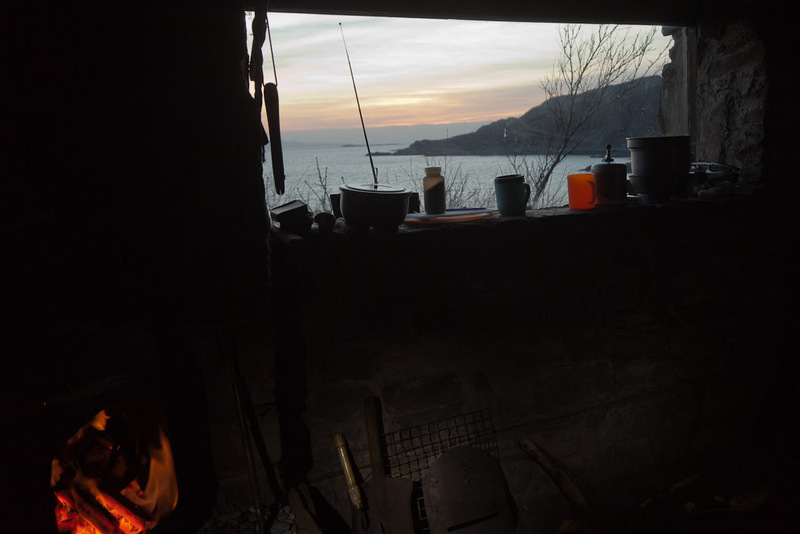 The thigh braces were not so aggressive and supportive as those in the Rockpools and Tideraces but were more pronounced than those in the Nordkapp LV and a bit less so than the Etain. The Quest, Gometra, GT and Xplore M allowed a higher position of the knees, which some may prefer. The Cetus MV thigh braces come fitted with a 3mm layer of closed cell foam. 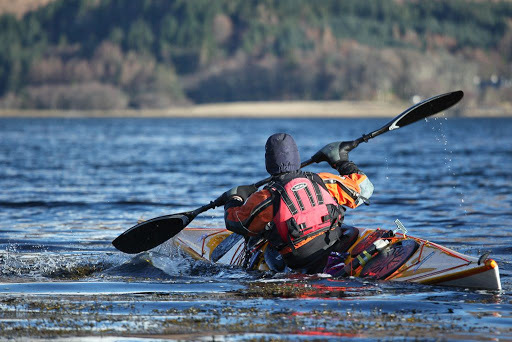 One of the eight Cetus kayaks I have used, lost one of these pads after a few outings. Overall, I found the Cetus MV braces to be a very happy compromise, they allowed a very comfortable range of thigh positions from relaxed cruising to full “brace in a tide race” mode. The test Cetus MV came with a custom bulkhead and a block of closed cell foam shaped to the bulkhead's profile. I found that the custom bulkhead was suitably reinforced to take the pressure of the toes and I used just a little of the foam to create toe pads. I paddle in UK size 10 boots and despite the fore deck's low profile; there was enough room for daylong comfort. The Cetus MV was fitted with a shorter fore deck pod than the Cetus HV and so my toes could get into the midline in front of it when I wanted to stretch my legs (29"/74 cm inside leg) or have a rest. I think if I was ordering a Cetus HV, I would ask for a short pod as fitted to this MV. I would be happy to trade the increased freedom and comfort for the loss of pod space. The short pod is still capable of holding a small VHF radio, sun tan lotion, head torch, energy bar etc. One of the test paddler's with 76cm inside leg and UK size 14 boots found the MV too restrictive to use all day and went on to buy the HV version. The footrests fitted as standard are adjustable with large and comfortable plastic pedals. They slide on a track and are locked by twisting “paddles” which come back to just behind your knees. A 90 degree twist (while you are still seated) allows the footrest to be slid forward or back with your toes for a perfect fit. Some people have reported that a previous version (in which the paddle rod is attached to the footrest and pushes it back and forward) can give way under pressure. I found this version remained firmly in place in all seven Cetus kayaks I tried with them. 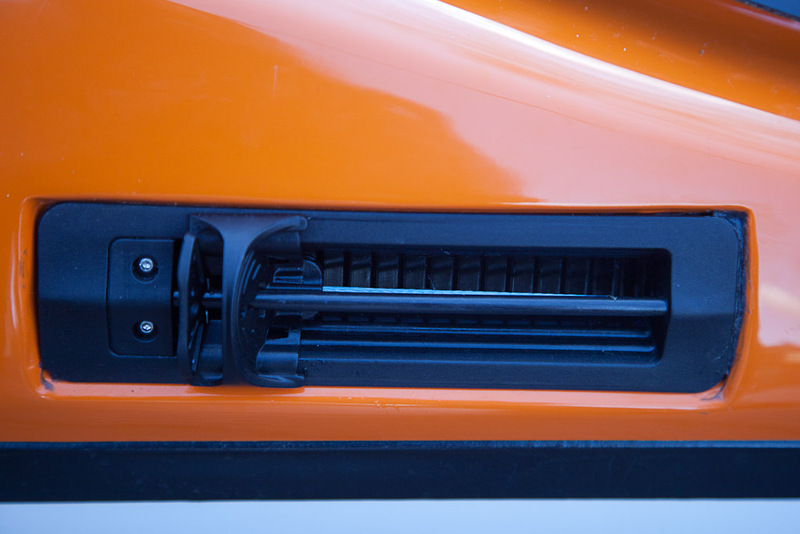 End toggles (secured by elastics), deck lines and elastics, Silva 70p compass recess and security/tow line bar were of the usual high P&H standard. Behind the cockpit there is a transverse deck recess designed to take a paddle shaft while launching and landing. Personally, I like to keep my nice carbon fibre paddles well out of the way of my bum and the beach. However, there is no doubt that the moulding adds to deck rigidity and due to joint problems I do like to sit on the rear deck before getting my legs in and out of the cockpit. In comparison, the flat rear deck of the GT was very flexible and I did not like to put my weight fully on it. 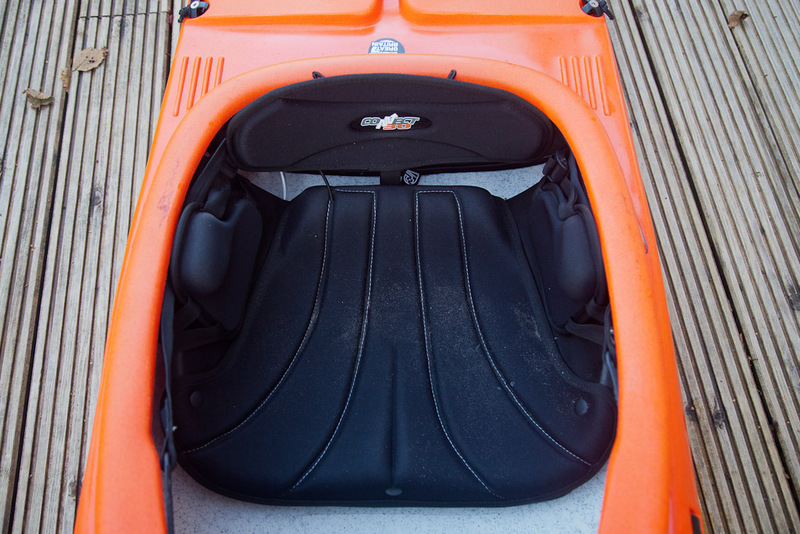 A large rubber Kayak-Sport oval rear deck hatch was partnered by a smaller round one towards the bow. Little moulded drainage channels in the deck extended out from the hatch rims reducing pooling of water. The day hatch and fore hatch were lighter covers with plastic centres. All covers were tethered. Tent poles need to be removed from a tent bag to bend it through the round forward hatch. The oval front hatches in the Valley Etain 175 and Nordkapp LV made it easier to load long objects. In five previous P&H Cetus kayaks I tried, all compartments remained dry. In terms of carrying capacity, the Cetus MV with standard bulkheads carries gear and supplies for a week's self supported expedition. (It is about the same volume as a Nordkapp LV.) The relatively narrow fore deck together with its sculpted shape means it is easy to get the paddle entry well forward and close to the hull for efficient paddling. The decals are quality items and not cheap transfers. They are 3D items and I particularly liked the bow logo, which looks like an eye. 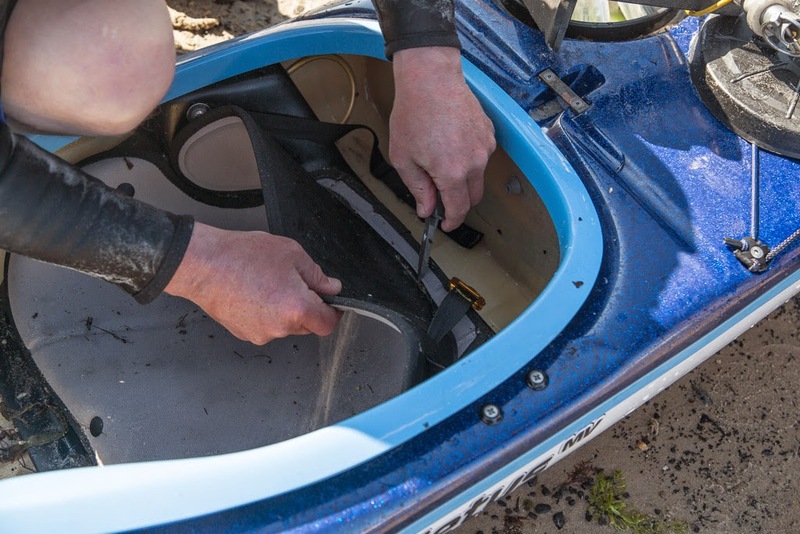 The test Cetus MV was fitted with a prototype of the second generation skeg slider that is now fitted to all P&H sea kayaks. The skeg system is an ingenious slider on a ratchet that pulls the skeg up, and holds it up, against a shock cord that pulls the skeg down. Unlike some of the first generation sliders, this new one has remained light and positive and very easy to operate. After 5 months the skeg slider box came out the hull. There had been very little adhesive holding it in. I sent photos to P&H who have amended instructions to their fitters on production kayaks. I have used the mark 2 skeg slider in the Aries and retrofitted one to my Delphin. I have had no trouble with any of these. The slider is intuitive to use as you pull the quick release lever back as you pull the whole slider back to put the skeg down. My one small gripe occurs in winter when wearing pogies. Sometimes the pogie brushes against the quick release on the front of the slider allowing the slider to slip back and drop the skeg. P&H have told me that production versions of the 2nd generation slider have a stronger spring to resist this. Because some previous skeg sliders were stiff , P&H have been supplying their recent sea kayaks with a very lightweight 2mm downhaul elastic in the skeg box. They also recommend setting the skeg up so that there is almost zero tension in the elastic when the skeg is fully down. 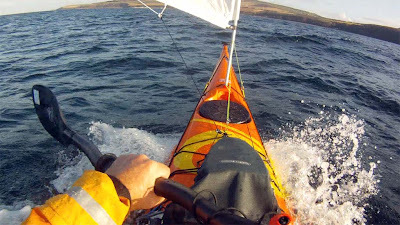 I have discovered that even with the new slider, the Cetus MV skeg sometimes does not go fully down when you start paddling downwind in force 4 to 5 conditions (or when kayak sailing at speed, it retracts). After you pull the slider back, you end up with a loop of blue cord sticking out behind it. It does not seem that the downhaul elastic is strong enough when there is sideways water pressure on the skeg. When at sea you can relieve the pressure on the skeg and get it to go fully down by rocking your pelvis from side to side. Since the Mark 2 skeg slider moves so easily with little friction, I have fixed this problem by replacing the downhaul elastic with a heavier grade of 3mm shock cord. The slider still has a light action but the skeg now goes fully down every time. P&H now recommend storing the kayak with the skeg down to avoid stretching the elastic they also advise replacing the elastic each year. This is easy to do. I found the primary stability of the Cetus MV on flat water to be exceptional, only slightly less than that of the Cetus HV. It is significantly more stable at rest than the Nordkapp LV and Taran 16 and a little more stable than the Alaw Bach and Xcite. In practical terms, I can do a cowboy re-entry into the Cetus MV but not into the Nordkapp LV. Once moving in the confused waters round a headland the Cetus MV and Nordkapp LV both gave a significantly easier ride than the others, especially the Quest, Etain 175, Xplore M and GT, which are all bigger volume kayaks. I think that this is because the volume in the Cetus MV and Nordkapp LV is concentrated towards the cockpit. In comparison the Etain 175, Alaw Bach, GT and Xcite are more parallel sided with more volume towards the ends. However, the wonderful rough water stability of the Nordkapp LV works only while you are actively paddling. In contrast, the Cetus MV has allowed me to take photos with a DSLR in rougher water than in any other kayak I have paddled. (It also scored highly for camera work because it is so quick to turn and change viewpoints.) 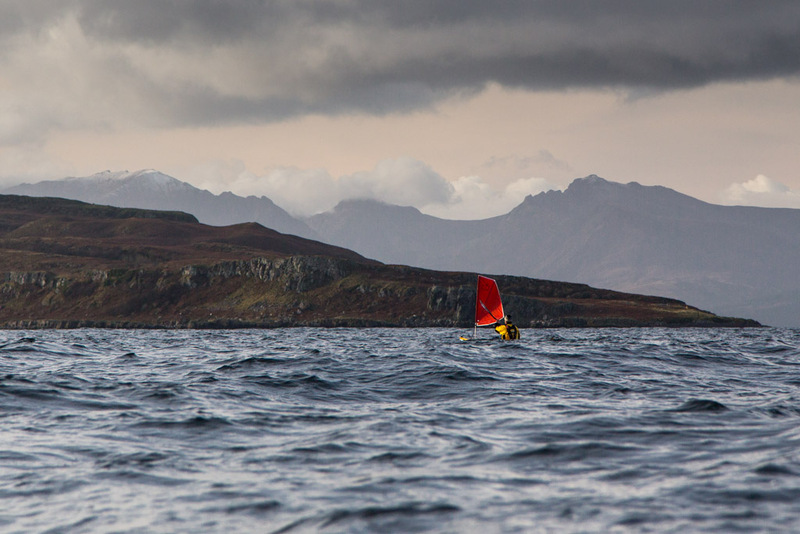 It is quite simply the best kayak I have ever been in for photography. The Cetus MV is easy to roll and the rear cockpit rim and relatively low rear deck allow back deck rolls. Once back up it settles in the upright position very securely. However there is a definite "notch" felt when you apply turning pressure to get the hull turning the right way up. In contrast, the Nordkapp LV rolls up very smoothly (and with less effort) but is much more likely to carry on rolling once you are up and then capsize on the other side After a re-entry roll, with a flooded cockpit, the Cetus MV proved to be more stable than the Quest, Alaw Bach and Nordkapp LV. 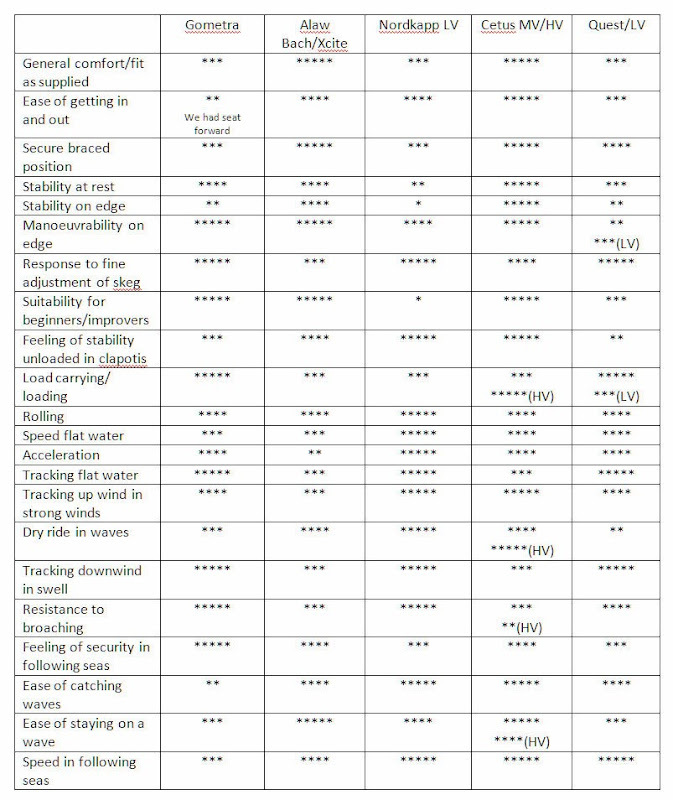 Having paddled the Cetus LV, MV and HV, I have discovered that the MV is the most manoeuvrable of the three for my weight, when used as a day kayak. When trying a CetusHV/MV/LV, you should choose the smallest size that still allows the waterline to shorten as you edge. 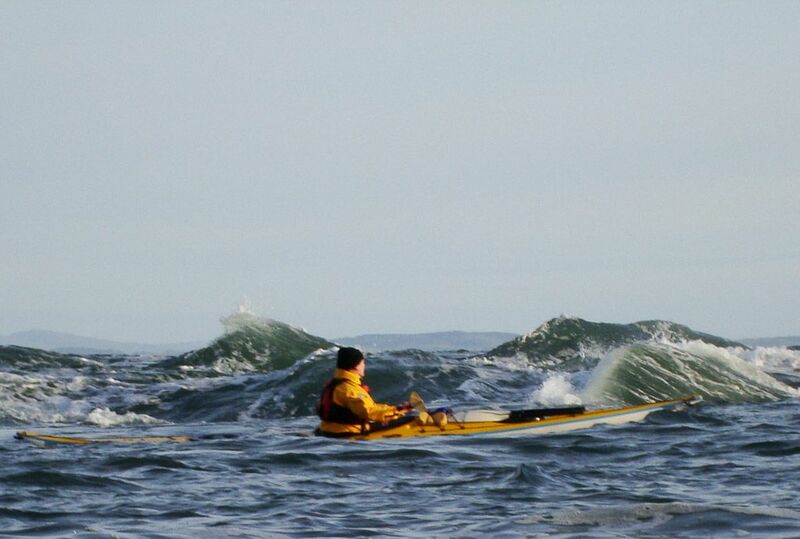 A satisfying gurgle from the stern during an edged turn should be a clue that you are in the right kayak. In moderate wind and water conditions it is easy to maintain a course in the Cetus MV using a little edge or skeg but it does not track so straight as the Quest LV, Etain 175, GT, or Xplore M, without edging or the skeg. In rougher conditions The Cetus MV and the Nordkapp LV are both easier than the other four to paddle into waves at about 45 degrees as their increased manoeuvrability means they are easier to steer round broken water. The Cetus MV proved to be very quick to accelerate up to top speed. 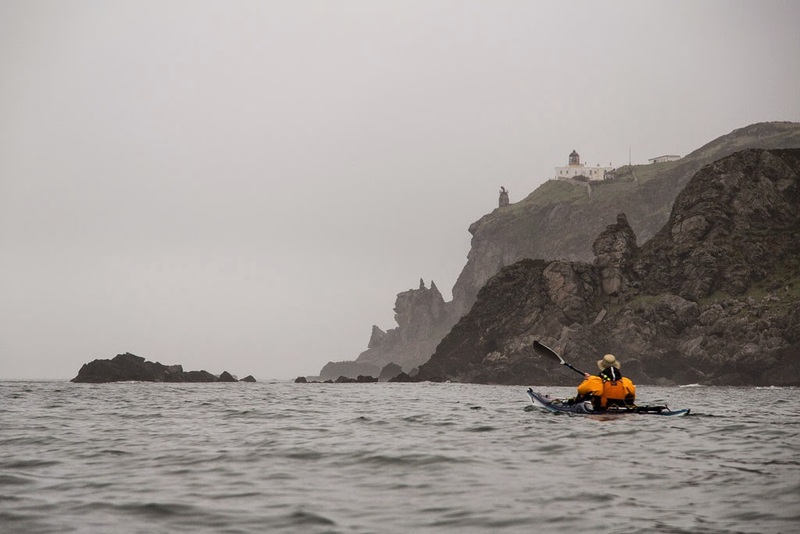 The Cetus MV, Cetus LV and Nordkapp LV all required fewer strokes to hit their maximum and pulled ahead of most of the other kayaks we paddled. On the same day I found that the Cetus MV, Nordkapp LV, Etain 175 and Xplore M all had a similar maximum sprint speed, which was greater than the Alaw Bach and Xcite. Both of these tended to squat on their tails, increasing drag when paddling hard. However, none of the above kayaks could match the acceleration or top speed of the Taran 16. 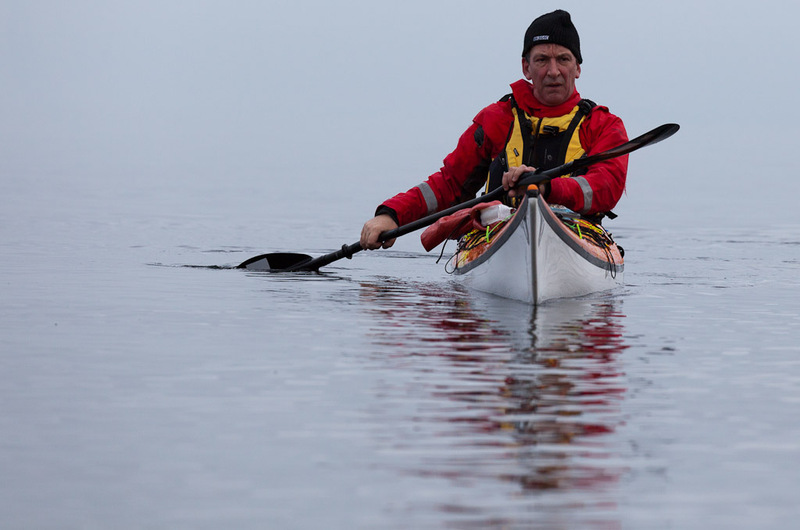 After paddling the Taran 16, the others all seemed slow. However, at the speed we normally cruise at (6-7km/hr) none of these kayaks would have difficulty keeping up with the others. Having such a low profile means that the Cetus MV behaves very well in stronger winds however, it is a wetter kayak in waves than the bigger volume kayaks like the Etain 17.5, GT and Xplore M. The Cetus MV bow rises less over short steep waves than those kayaks and it and the Nordkapp LV do not slam down into the trough like the Taran 16 and other flatter bottomed kayaks. Unloaded, in force 5-6 winds (over sheltered waters in the lee of a low headland) the Cetus MV, Nordkapp LV and Taran 16 could be comfortably paddled into wind and short steep windblown chop at 45 degrees. The Taran 16 was more of a handful but was fast. 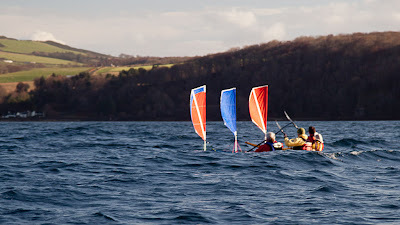 In these conditions the Alaw Bach, Xcite, Etain 17.5, GT tended to have their bows blown down wind. The Cetus MV and Nordkapp LV were the easiest kayaks to turn, bow through the wind in winds approaching force 6. The Cetus MV can be used without a skeg, as it is so responsive to edging. 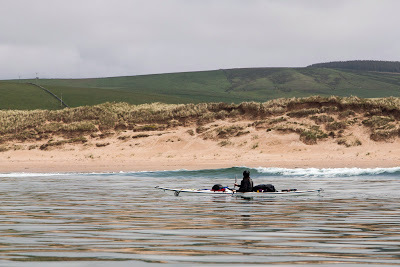 However, on long windy crossing, I still much prefer to use the skeg and both it and the Nordkapp LV were the easiest to set the right amount of skeg and keep on line when paddling about 30 degrees to about 150 degrees from the wind in force 4 and above. In small to medium following seas and in surf, the Alaw Bach and Xcite picked the waves up with much less paddler input than any of the other kayaks in this group. 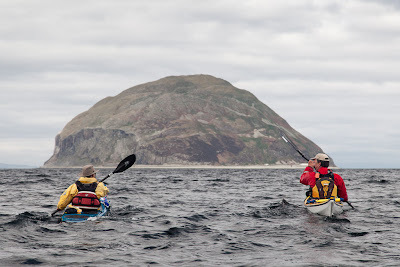 However, an experienced paddler could use the acceleration of the Cetus MV, Nordkapp LV and Taran 16 to catch even the most unpromising swells on open water, which the Alaw Bach and Xcite were too slow to catch. Once on the wave, the Cetus MV was steerable by edging, especially if you stayed well up near the crest. It was more manoeuvrable than the Alaw Bach and Xcite on the wave but required more paddler input than these to avoid broaching in surf. However, on one difficult open crossing, with a fast swell from one rear quarter and a gusty force 4 wind from the other rear quarter, the Cetus MV proved much easier to keep on line than the Xcite. The Cetus MV was also very controllable coming in through the surf zone on the approach to a landing. 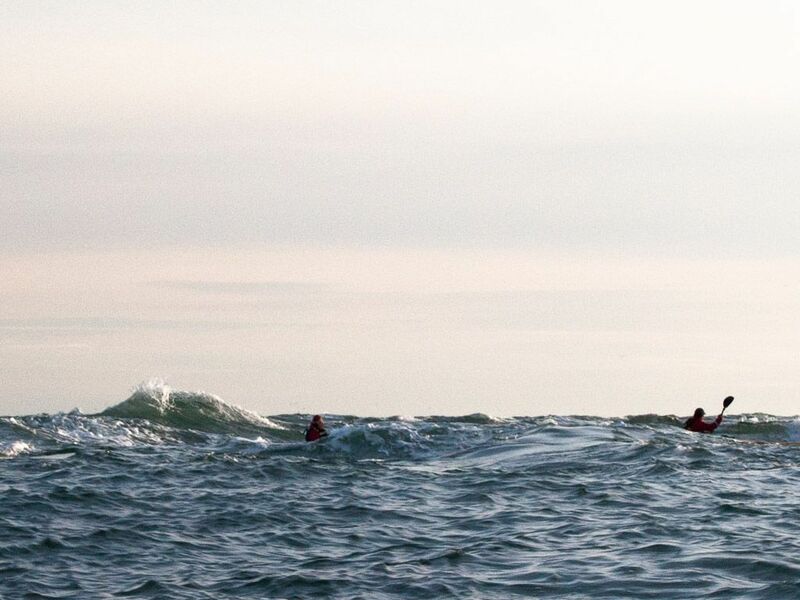 A great deal of this controllability was due to its quick acceleration, allowing you to slow down, let a threatening wave through, then accelerate to catch a more manageable wave, to carry you into the shore. After a broach in surf, the Cetus MV was very stable when braced into the wave, the lack of chines reduced the likelihood of a shoreward flip. 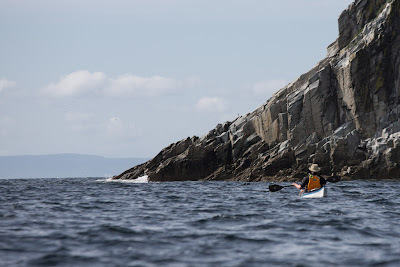 The Cetus MV was also one of the easier kayaks to straighten up from a broach. 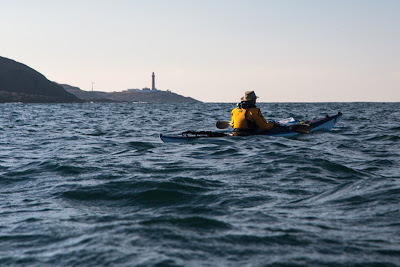 Although not as fast downwind as others in this group, the Malin Gometra was very easy and reassuring to paddle downwind in confused and breaking seas. The Cetus MV was faster as it was easier to catch more waves than the Gometra but it also required more paddler input. Just looking at its fine bow sections, we wondered whether the Cetus MV might be at risk of pearling (burying its bow) when paddling before steep following seas. However, there is a distinct upward curve in the sheer line from the front hatch forward and on test, pearling was not an issue, loaded or unloaded and with or without a sail. Overall, the Cetus inspired confidence, giving a very smooth passage through difficult, rough water conditions. Immediately under the Mull of Galloway, on a west going tide, there is a very dramatic eddy line. The main current is moving at 22km/hr and the eddy is moving about 5km/hr the other way. The Cetus MV is the best kayak I have used for breaking out of the main flow into this eddy. 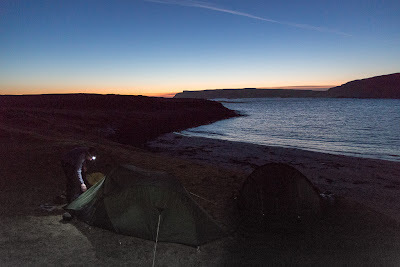 It was not possible to swap kayaks on the day due to the lack of landing sites and inability to get back against the current but I have used my Quest LV, Alaw Bach and Nordkapp LV here and the Cetus MV is the easiest and most confidence inspiring. I think it is a combination of its stability and lack of chines that give the paddler the feel of confidence. I kept my expensive digital SLR in my deck bag going round the Mull at full flow(11knots) in the Cetus MV and HV but in my other three kayaks I have kept it in the day hatch. 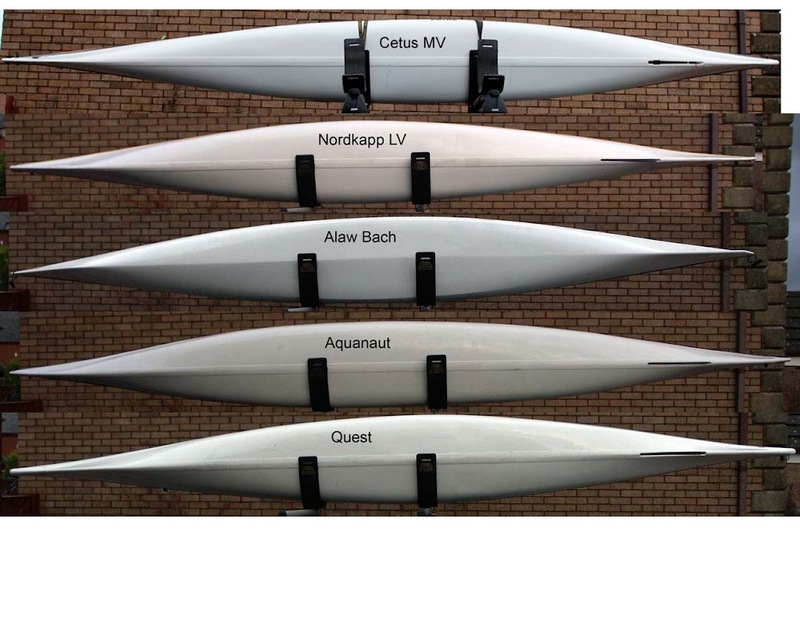 The Cetus MV has a smaller volume than several of the other kayaks I had initially compared it with. 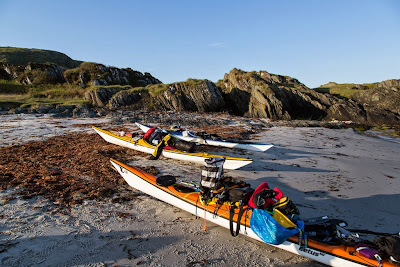 On the water and when packing, it feels of similar volume to the Quest LV, Alaw Bach, Nordkapp LV but is surprisingly smaller than Xplore M, Xcite and the Etain 17.5. It is obviously a lot smaller than the Quest, GT and the two Tarans (though the Taran 16 feels and behaves like a much smaller kayak). 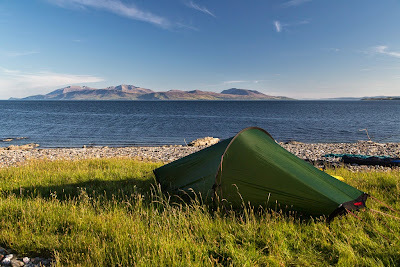 The Cetus MV with a standard bulkhead position takes the same amount of gear as the Nordkapp LV and Alaw Bach, which I find is enough for a self supporting trip of a week and more than enough for a weekend. However, for personal use I would consider getting one with a strengthened custom bulkhead (£90) positioned to maximise front hatch volume and minimise cockpit volume. This will increase the versatility for camping expeditions. With a custom bulkhead for a 31" inside leg (P&H prefer to allow 2" over your inside leg) the Cetus MV takes considerably more gear, about the same as a standard Quest. With an 85kg paddler and 35kg gear aboard (see photo above), the Cetus MV is ridiculously stable, both at rest and on edge. It is also much more directional as the built in skeg no longer disengages and shortens the waterline when edged. It and the loaded Nordkapp LV are much less affected by strong winds than any of the other kayaks in this review. For my weight I found the Cetus MV to be the ideal compromise size for day and short expedition paddling. Loading a traditional British style kayak like the Norkapp LV, I tend put an equal weight of gear in the fore and aft compartments, then put my water bag behind the seat. 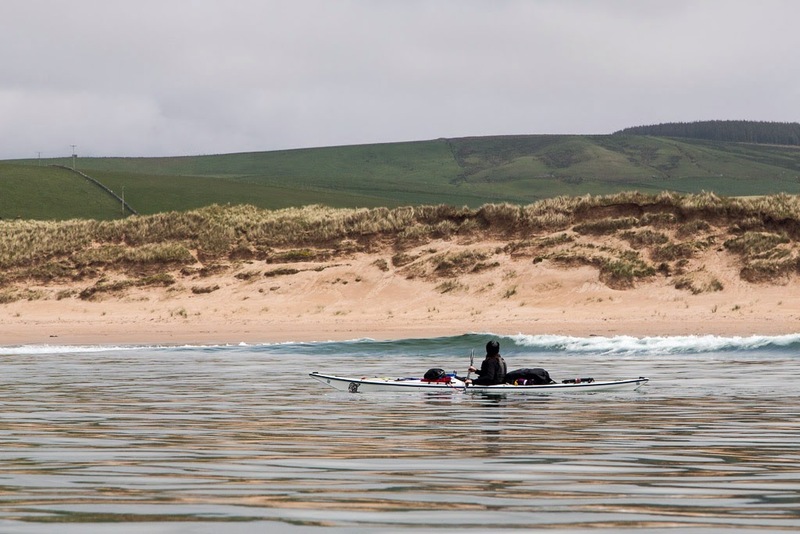 In the Cetus MV I find it paddles better down wind and swell with the gear weight distributed about 60% to the rear. Don't attempt to add up the columns, I haven't! 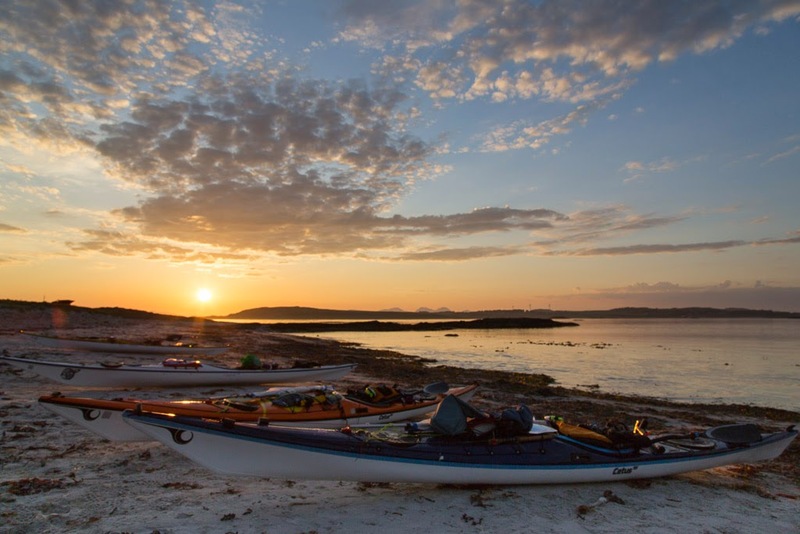 Each person will rate and weight performance characteristics differently but this might help decide which of these kayaks suits your paddling style and is worth taking for a test paddle. Long term wear and tear. The orange test Cetus MV has survived the test and come out gleaming despite hard use and being used by a considerable number of different paddlers. Apart from some light scuffing on the deck and superficial scratching on the underhull there are no signs for concern. There is no evidence of delamination, gel coat cracking or voids under cracked gel coat. The gland where the skeg cable enters the top of the skeg box began to leak after 6 months. P&H offered to take it back to the factory to fix it but I was happy to fix it myself with some Sikaflex sealant. The Mark 2 skeg has remained light and easy to use but I replaced the elastic at 12 months as I noticed the skeg began to lift when planing while paddle sailing. 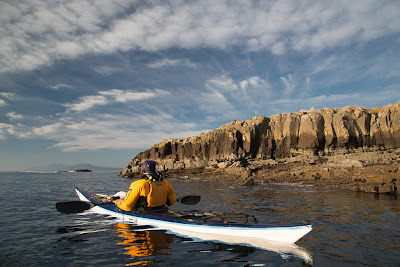 After prolonged use three Cetus seat backs in our group have folded just above the seat, forming a crease, which is uncomfortable on a long paddle. During a six day paddle my friend Mike cut the bottom of the seat back off, which cured his sore back. P&H now offer the Connect 30 seat (as fitted to the Delphin and Aries) as an option on the Cetus and I would recommend selecting that as we have had no problems with the Connect 30 seat. Sea kayak paddle sailing is becoming more popular in the UK, particularly since the recent arrival of the light, simple Flat Earth kayak sails from Australia. The Cetus MV is one of the best sea kayaks for paddle sailing I have tried. It is stable yet fast and manoeuvrable. The Cetus MV is particularly good downwind and is better upwind than the Nordkapp LV, Quest, Quest LV and the Alaw Bach (which is not as good as the others upwind with a sail). The Cetus MV is not only faster upwind than the others, it also points higher into the wind. 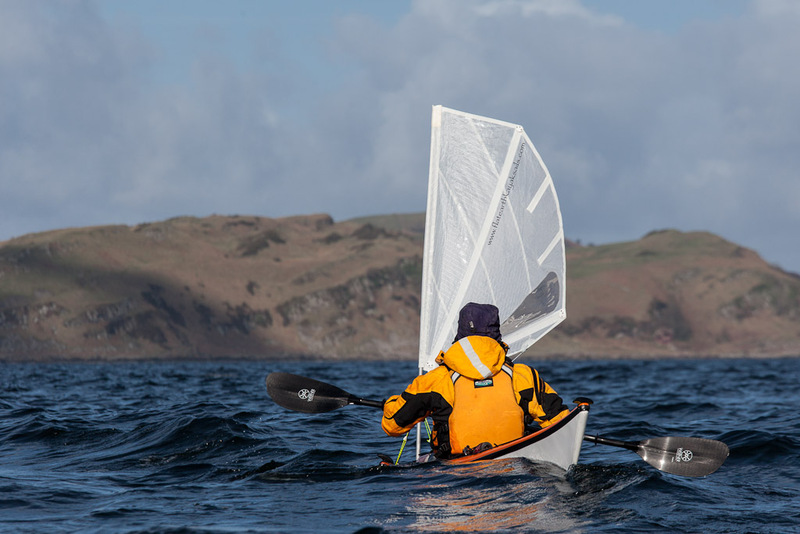 ...it easily outstrips a strong paddler in a Taran 18 without a sail. The Cetus MV has the wide point behind the cockpit which encourages planing in less wind than the Nordkapp LV, which has its wide point forward of the cockpit. 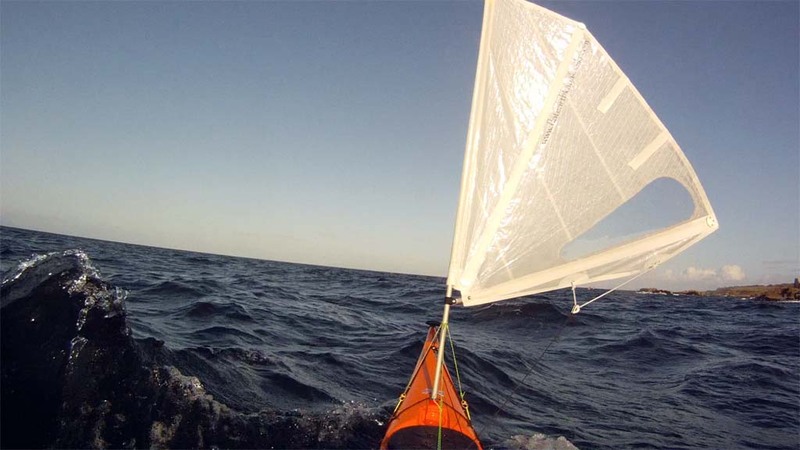 When planing with a sail in a decent wind in the Cetus MV, it is possible to overtake the waves in front. At these speeds it is worth experimenting with edging. You may find that the turning response to edging is reversed at speed, with the kayak now turning toward the dropped edge. In the Cetus MV this was more noticeable and occurred at lower speeds than in the Nordkapp LV. 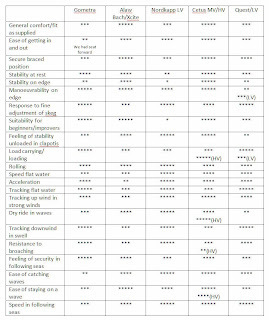 The Cetus MV is easier to control with a sail than the Taran 16 especially upwind in force 4 and above (though in skilled hands the Taran 16 is probably faster). However, the Taran 16 with a sail is a lethal downwind weapon and leaves even the Cetus MV behind. 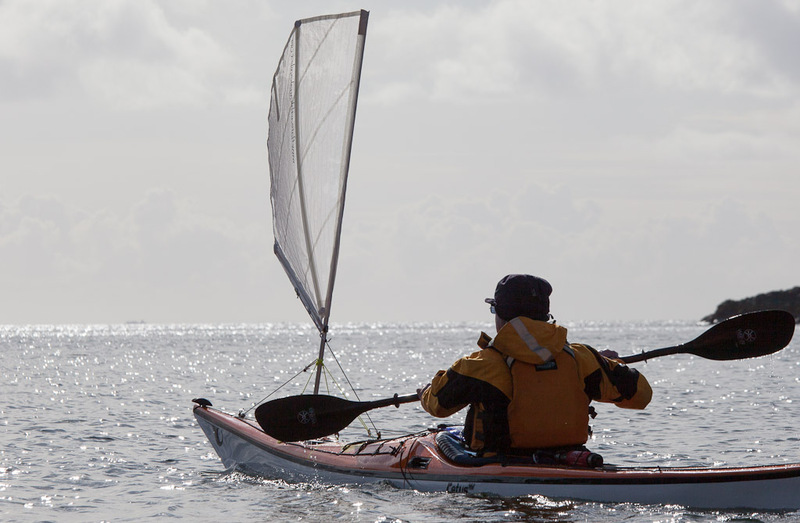 Overall the Cetus MV makes a very versatile kayak for paddle sailing. 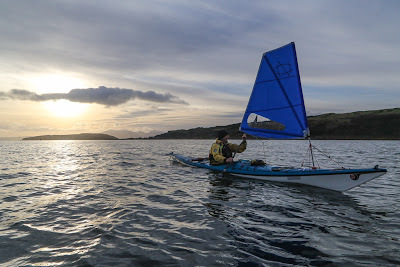 Its stability makes it an ideal platform for those new to sailing but its early planing, speed and manoeuvrability also give it appeal to advanced paddle sailors. If you are considering buying a Cetus MV, you should also try the other day/short expedition kayaks, which we paddled alongside it. The Alaw Bach and Xcite are equally playful on rough water but are more affected by strong winds. The Alaw Bach cockpit is smaller and at my weight I find it just a bit tight for day long comfort. The Quest LV is great downwind but is not as manoeuvrable or stable. The Nordkapp LV is not as comfortable but is an outstanding kayak with a similar range of strengths. 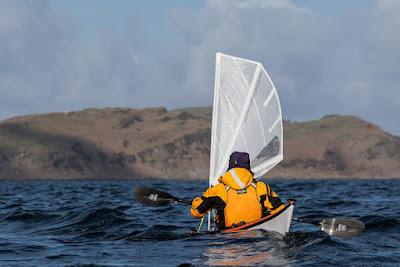 It is probably the best kayak of this size in very strong winds and rough water, except it does require more concentration and skill to exploit it. The Xplore M is very comfortable with a good turn of speed but is less playful, being more directional and expedition orientated. A wild card to consider is the Taran 16. Despite being bigger volume and of a very different design to the Cetus MV, it is also surprisingly versatile. 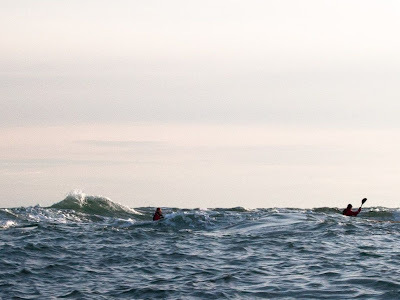 It excels downwind in waves but it can still carry a great load. The Etain 175, Quest, GT and Taran 18 are all much bigger than the Cetus MV and should more appropriately be compared with a Cetus HV. 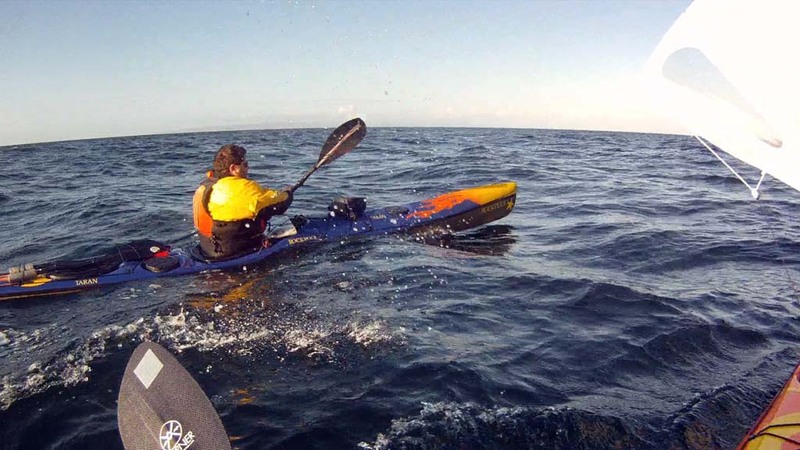 The Malin Gometra is a smaller kayak than the Cetus MV but has a similar waterline length. It is not as fast as the Cetus MV downwind but gives a very predictable and safe ride. 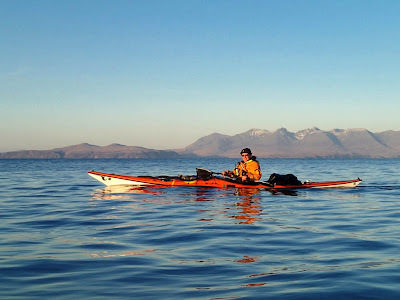 The Cetus MV has proved to be the most versatile day/short expedition kayak that I have tried. Its outstanding features are comfort, stability, speed, manoeuvrability, rough water handling and behaviour in strong winds. 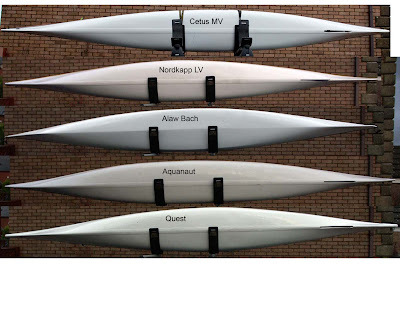 Lighter or heavier paddlers can get similar performance from the Cetus LV or HV. The beauty of the Cetus family is that they excel both on day trips and when loaded on expedition. 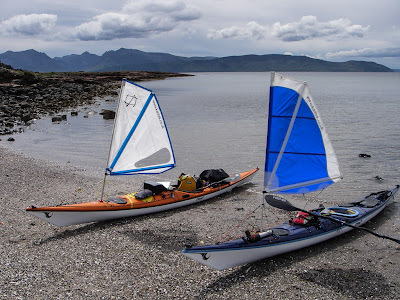 I (like many of my enthusiastic sea kayaking friends) ended up buying two sea kayaks: one for day use and one for expeditions. With the introduction of the Cetus family, this is no longer necessary. I have now sold my Quest and my daughter has inherited my much loved Nordkapp LV. I have bought a Cetus MV to replace them both! Weight (standard construction, custom bulkhead, optional keel strip, compass, inc. hatch covers): 27.9kg, length: 541cm, width: 54.5 cm, cockpit length: 80cm, breadth: 41.5cm, internal height at front of cockpit: 30.5cm, rear of seat base to inside edge of front of cockpit rim: 70.5cm, price (standard specification): £2349. During the period of testing of the Cetus MV, I have had free loans of P&H, Valley, Rockpool and Malin sea kayaks. "Thank you for such a thorough and measured review; we really appreciate the time and effort you take to fairly test our products. We are pleased that you have been able to use the Cetus MV in such a broad range of conditions and have managed to spend some quality expedition time in it. With regard to the rippling mentioned, without actually seeing the boat it is hard to determine what has caused this. We are looking into it however and, as always, are more than happy to assess any P&H boat that a customer has concerns over. We are really pleased with the new second-generation skeg system and thank Douglas as well as P&H Team Paddlers for their part in testing this; we have addressed and resolved all the issues around the spring, cord and elastic. We are constantly looking for ways to improve our boats, the fittings, construction and our service, so we appreciate all customer feedback. 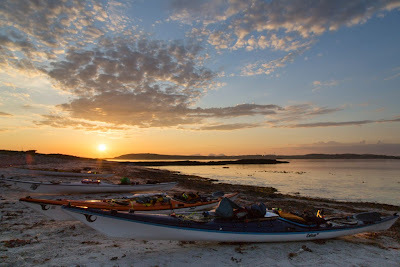 If you have comments you would like to share with us please send them to info@phseakayaks.com".